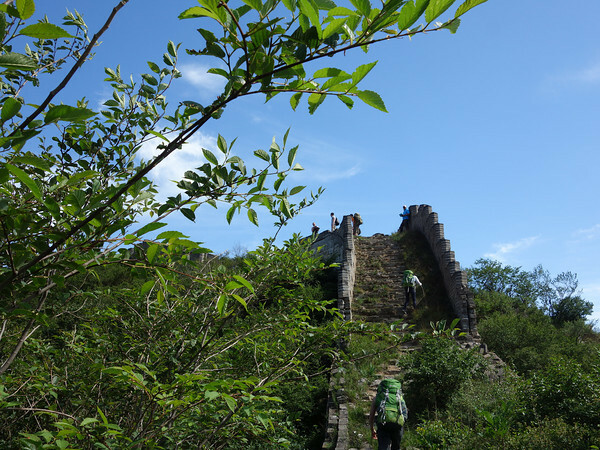 An epic 2 full days Great Wall hike combines the crumbled staircases and strange turns of the ChinaHiking founders’ secret Sunset Great Wall and Beijing’s highest Great Wall. 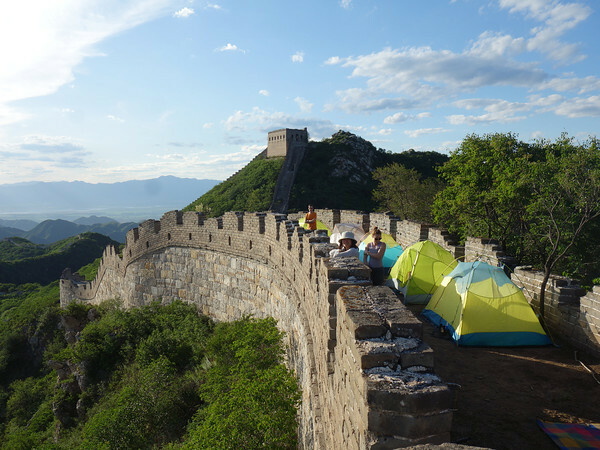 We camp on top of the Great Wall and hike all the way to Beijing’s highest watchtower. 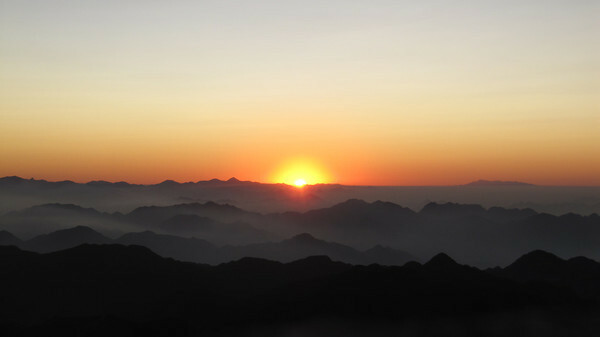 This perfect viewpoint will grant you top pictures the endless Great Wall build over the surrounding mountain ridges. 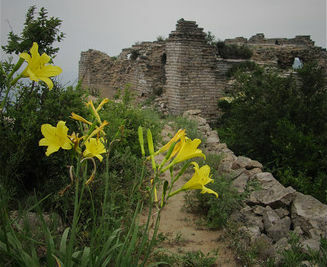 The secret Sunset Great Wall section is located about 15km north from the famous Badaling Great Wall. It’s a 2-hour drive from our meeting point at Lama Temple till we arrive at our lunch place, a local farmhouse with gorgeous views of the Great Wall. After a great lunch at the farmhouse courtyard we take a beautiful trail through the valley till we meet the Great Wall at its lowest point. 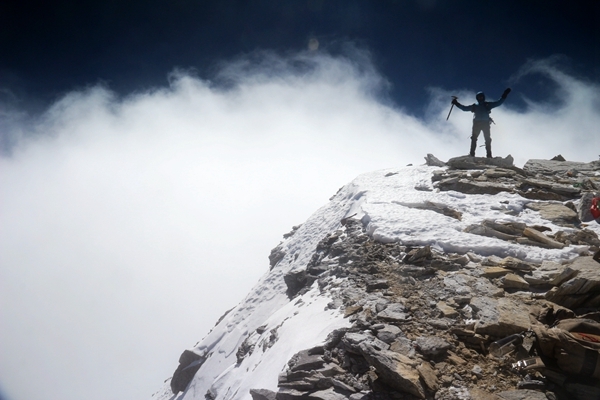 Here we start hiking the famous steep staircases for a good hour, passing numerous guard towers on the way. 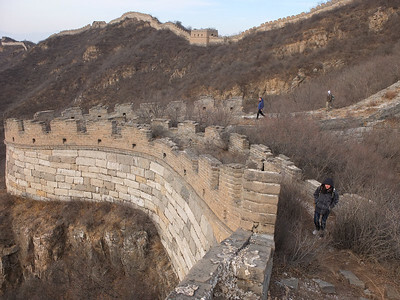 The highest section of the Great Wall has been partly restored and it is in a perfect condition for easy hiking now. 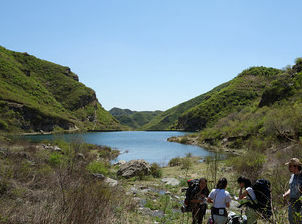 We continue hiking a bit more and looking for a nice flat place on the Great Wall to camp. 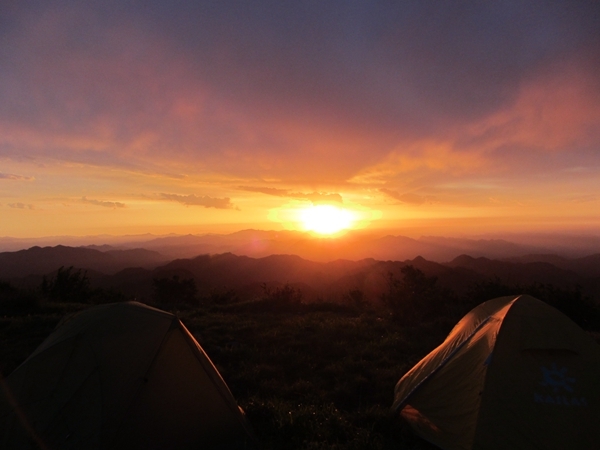 We put down our backpacks and pitch our tents. 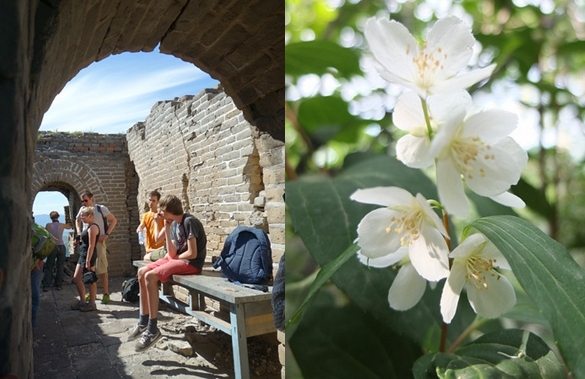 While the guides collect firewood and prepare dinner, you can go explore more parts of the Great Wall. 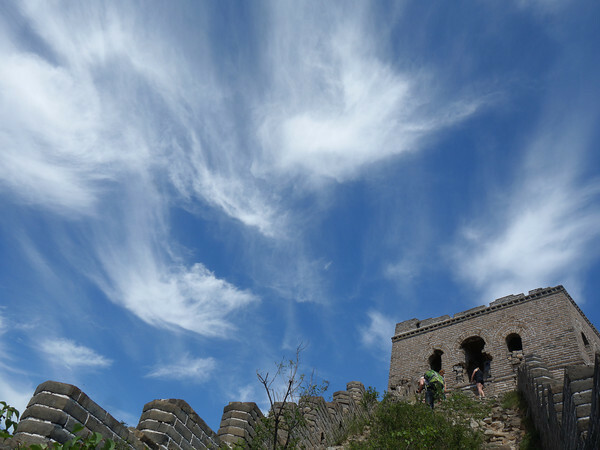 You will find more watchtowers and the famous 180 degrees Great Wall Turn, a perfect place for pictures. 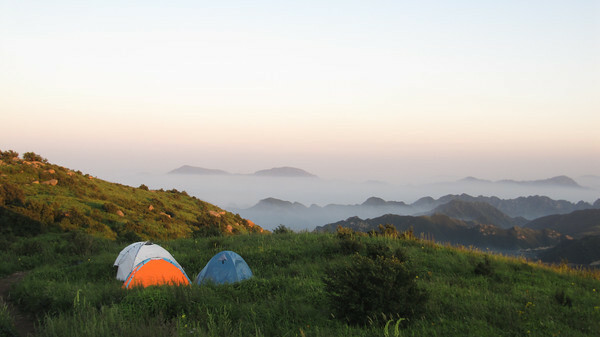 The camping spot is very magical, having a view on the highest Great Wall in the north, miles and miles of Great Wall in the south and the Chen Castle General Tower in the east. It is a great place to enjoy a wood fire cooked dinner and watch the sunset with beer or a glass of wine. 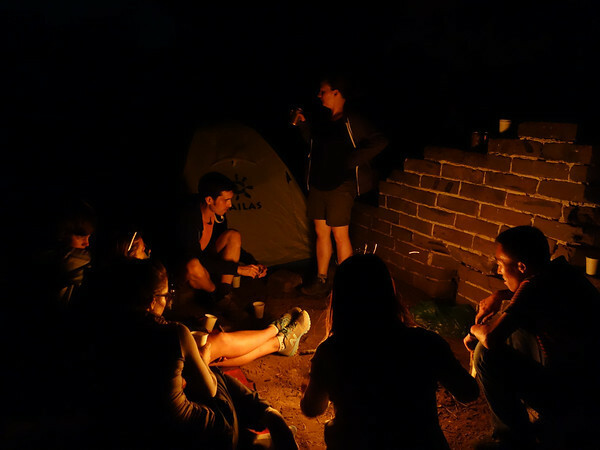 We fill the evening with sharing stories around the campfire and fall asleep by counting the stars. A small forest trail leads us pass an old beekeeper and walk into the forest. 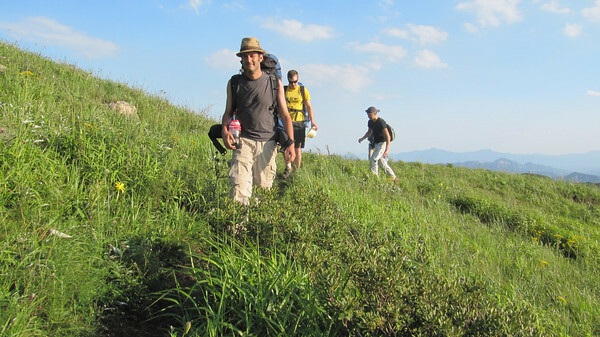 The trail becomes smaller and steeper as we hike up the Bijia Mountain and the fantastic sceneries unfold as we walk further down the trail. 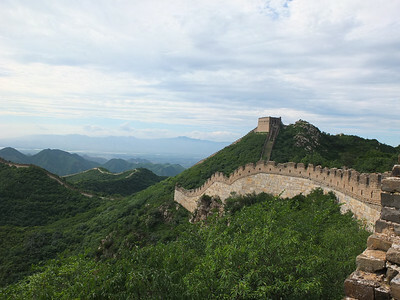 After hiking around 2 hours, we reach the mountain ridge and see the Great Wall on the top. We relax and take some pictures as a break time. We continue our hike for another 1.5 hours on the steep staircases of the partly restored Great Wall till we reach Beijing’s highest Great Wall watchtower. 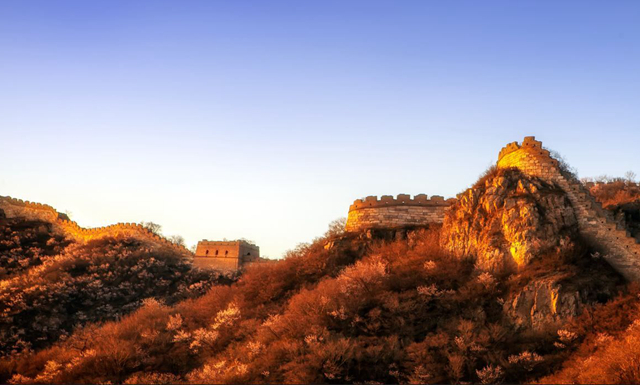 With its 360 degrees view over the mountains and miles and miles of Great Wall, there is no argue that Great Wall tower we are going to see is the most scenic view in Beijing. We cross the mountain top and follow a gentle downhill ridge trail for about 2 hours till we reach an authentic mountain village completely built with the Great Wall rocks and bricks. It’s a hidden cultural gem where just a handful of people still live in a traditional way. Our driver will be waiting for us in that village to drive us back to a local restaurant for a well-earned late lunch before we head back to Beijing. 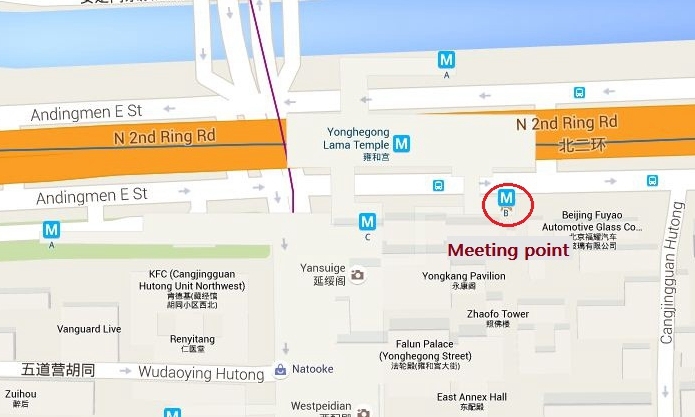 By 6.30pm, we will be back at our Lama Temple meeting point. 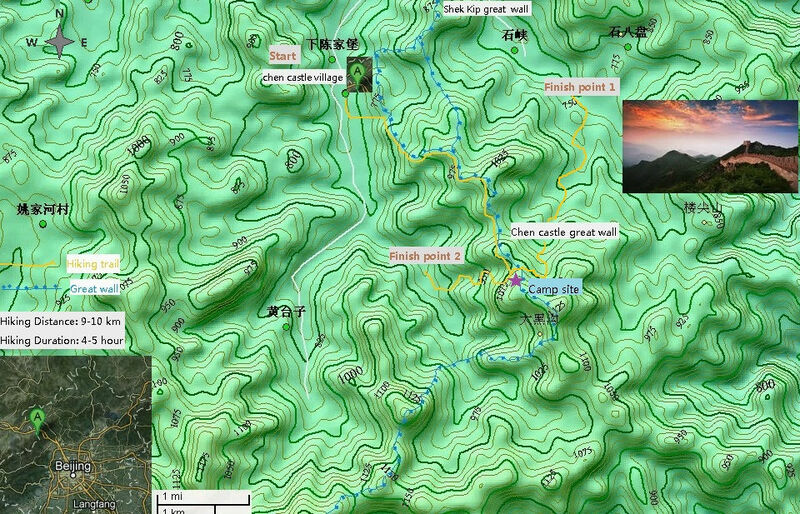 We rate this hike a level 4 (medium-strong) as its both days’ hike start with steep climbing on the Great Wall where it can be slippery sometimes. 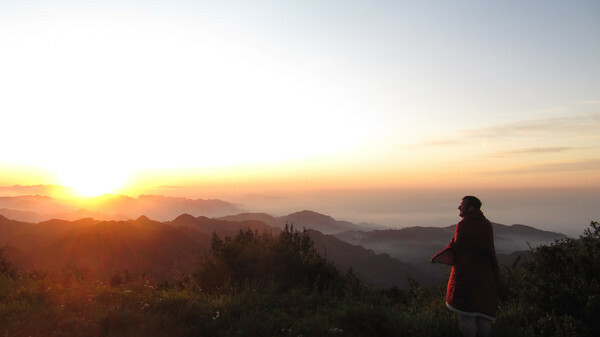 You should be all right if you have a normal to good physical condition, as we never rush during our hikes. In the first day, we carry our backpacks up to the camping spot. The second day we hike without backpacks. 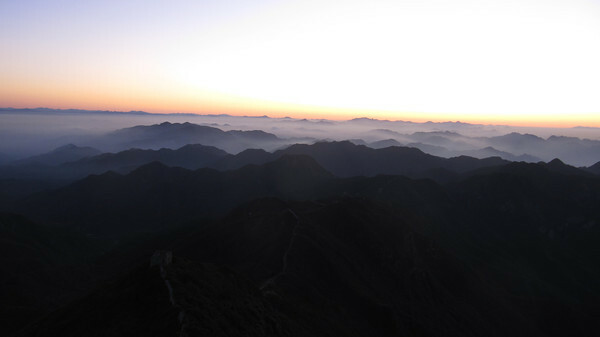 This section of the Great Wall was called Humpback (Luoguo Cheng), later the name changed to the Sunset Great Wall because the ChinaHiking founders found out this is a perfect and best location to watch sunset on the Great Wall. 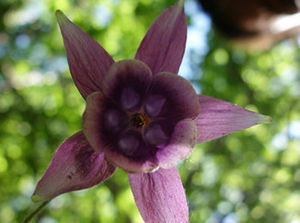 It is located in Huailai county, Hebei province, west part of Beijing. 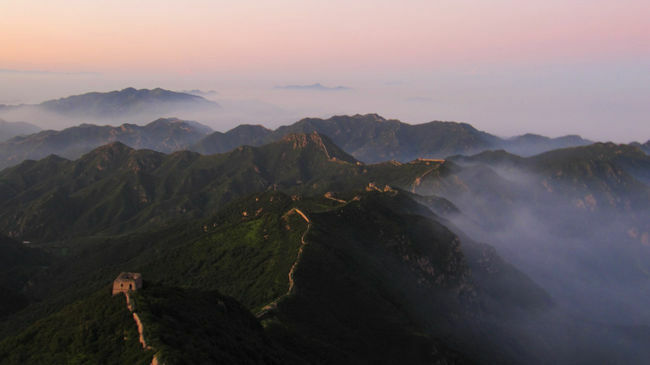 Due to its geographical uniqueness, the direction of its mountain ridge, the Great Wall formed a huge 180°of an “U” turn. Thus the local people call it “Luoguo Cheng”in Chinese or Humpback. The Wall was rebuilt in the Ming dynasty (year of 1544), the watchtowers in this section were rebuilt under the rule of emperor Longqing ( year of 1567-1572). It was built away from the villages and with such good qualities, so after 500 years, there are still many sections are well-preserved. The army of Lizicheng, the Nomad King who end the Ming dynasty, led numerous attacks to Beijing. As his army grew stronger, the imperial forces led by field marshal Sun Chuanting were getting weaker due to famine and disease. 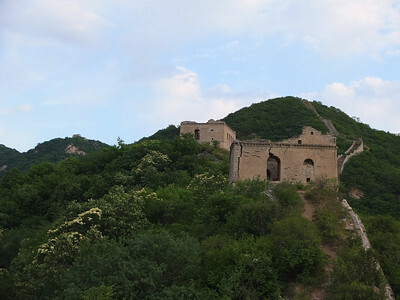 In 1644 Lizicheng succeeded in breaking the lines of the Great Wall at the Chen Castle and Humpback Great Wall, conquered Beijing and ended the Ming dynasty. 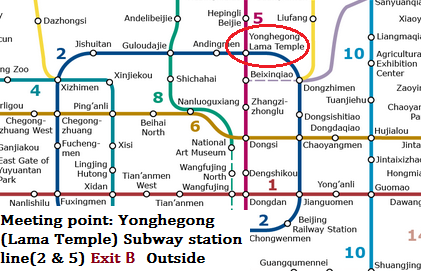 Emperor Chongzhen hanged himself on Coal Hill (Jinshan park) and was buried in Siling, in the Ming Tombs area. There his tomb is preserved in excellent condition and people speculate on why all the trees in this spot have been struck by lightning. Sun Chuanting died in battle at Tungguan. His wife committed suicide by throwing herself into a well. They were buried together in Huazhuang village in Shanxi province. Their grave was looted and destroyed during the ravages of the Cultural Revolution. There are 47 watchtowers in total in this section of the Great Wall. 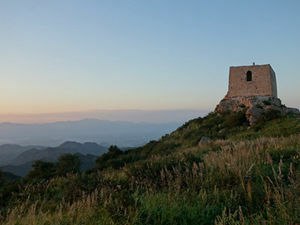 The General Tower features with 6 holes; round shaped watchtower also claimed to be one of the highest watchtowers (1784 meters above sea level) around Beijing. Shooting holes in the Wall, are designed very scientific, elegant and romantic in some ways. Each hole is slided down from the top to the bottom, which not only created a great effect to observe the enemies from the top and but also made the enemies’ arrow invasion hard to get through the holes. More surprisingly, each hole has a exquisite patterns. 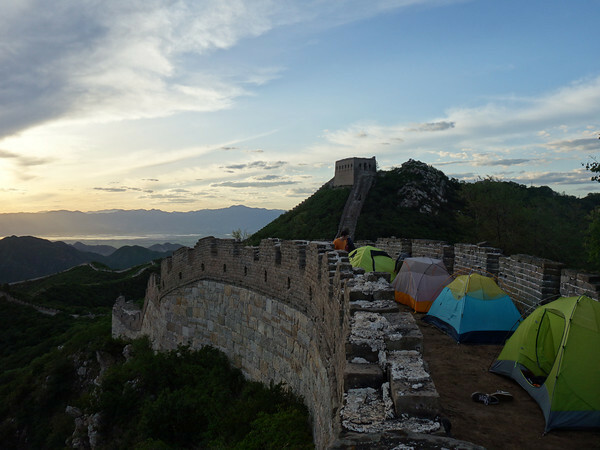 Because of its special design and features of the Wall, and its unique location, the sunset Great Wall is the top choice to watch the sunset after a great hike up to the Wall. 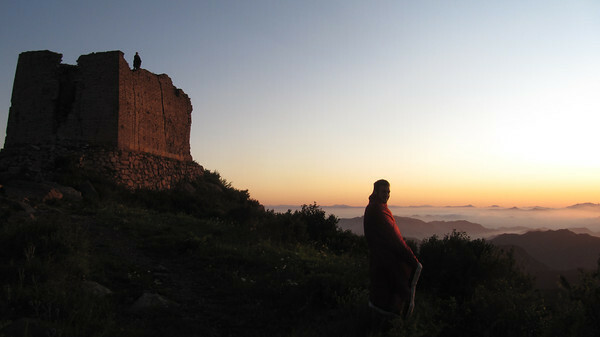 For years, the Sunset Great Wall structures fell into neglect for a long time. In 2012, the beauty of this Great Wall was rediscovered, and it was restored during the winter of 2015. This weekend we went camping at long Valley village. 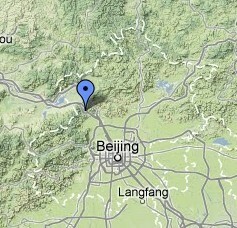 Once you get on top of Beijing’s highest great wall you understand why this is called long valley. 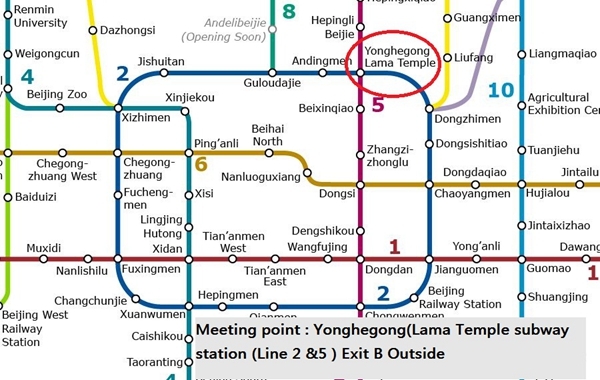 Through this area most of the traffic approaching (Peking) Beijing from the North is channeled . This was also the natural pass through the mountains fought over during times of war. After a bus ride and slow local taxi we arrived at one of Beijing’s cultural villages. We started with a good meal at a local restaurant and the with some ganbei’s of cold beer we started to know our new hiking friends a bit better. It didn’t take long to know that this was going to be a very nice weekend in good company. Although this is a great wall hike, the first 4 hours no great wall is to be seen but that didn’t make the hike less beautiful. The four hours hiking up the mountain gave us stunning views on the surrounding area’s. The flowers and butterflies enjoying the nice summer sun made this hike up just perfect. 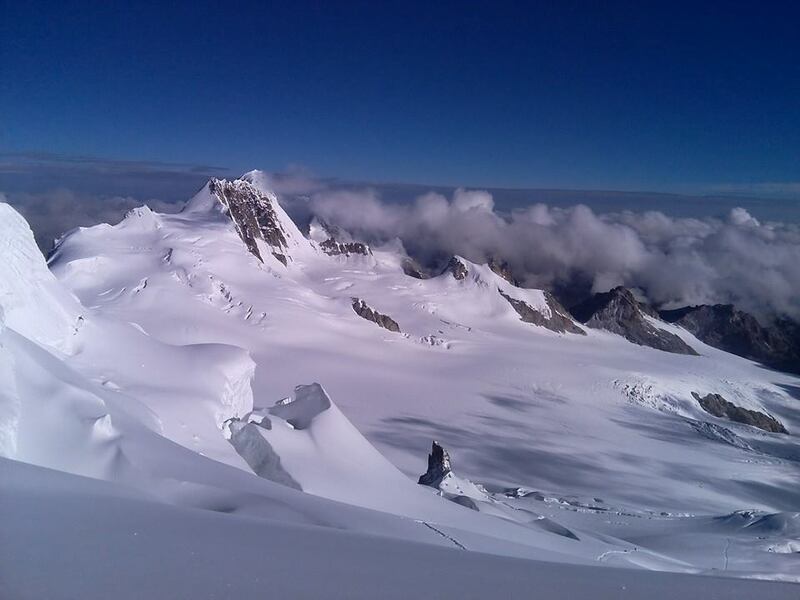 The first climax of the day came when we reached the top of this mountain and a long stretches of wall could be seen. It made everybody 5 minutes quiet. 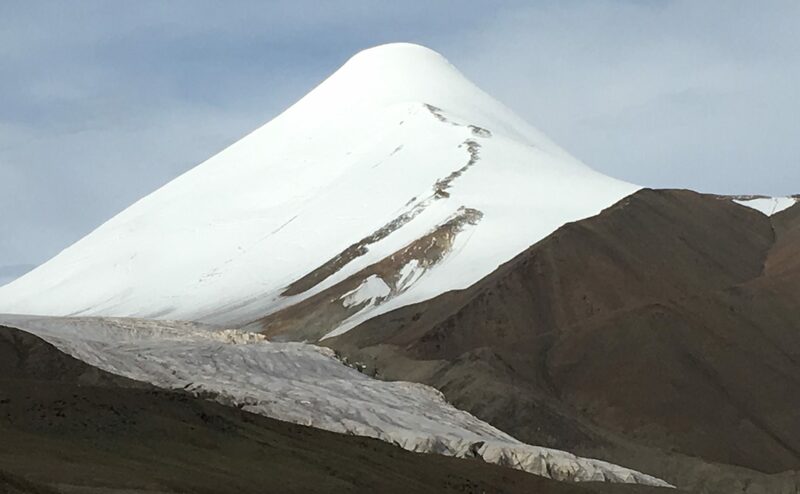 We pitched our tents in the high grass on top of this 1400m high mountain and climbed the beacon tower that majestically ruled over the whole area. 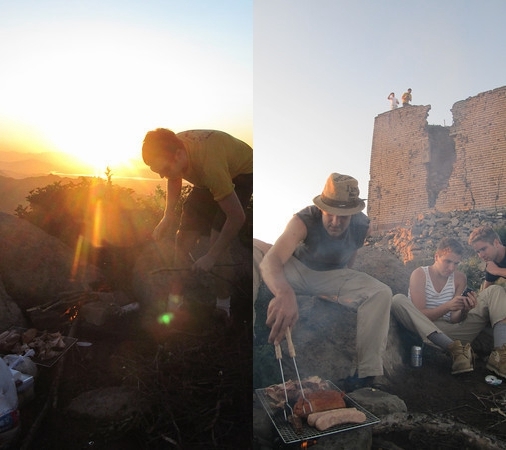 We gathered some wood for the BBQ, got the beer whiskey and wine out of our backpacks and prepared us for the second climax, sunset. It was a magic sunset. 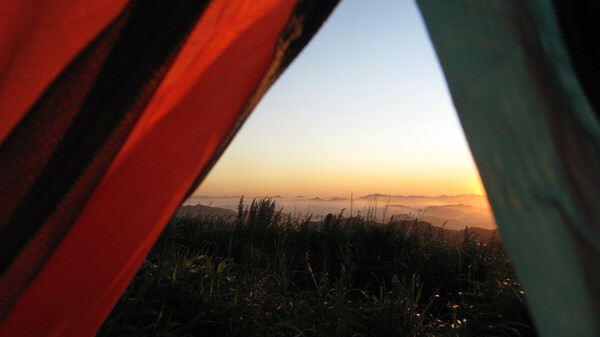 Slowly the fog slid in between the mountains under us and the sun covered them with a red carpet. If you think I m exaggerating have a look at these pictures With a nice BBQ, a few drink and jokes we ended the evening. As we all enjoyed this magic sunset so much nobody missed the sunrise at 4.30 in the morning. And again it was so worth getting up for. After sunset we went back to sleep for a few hours but by 8.30 we were all enjoying a good breakfast with the most stunning view. A smooth hike down on the wall, trough fields and orchards brought us at chengiabao village at the other side of the mountain. 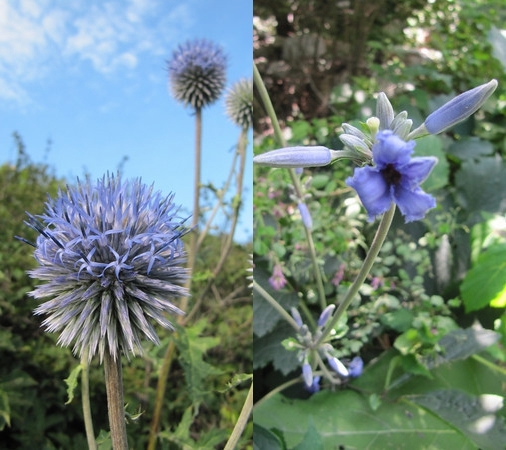 Mission accomplished, a perfect hike trough beautiful nature on a lovely summer day. Thanks guys for sharing this beautiful hike with us! We've lived in China for months and we saved the Great Wall until the very end of our time here. 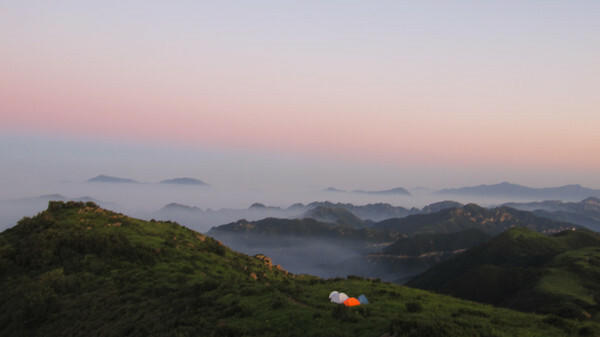 We decided China Hiking because it was one of the most affordable. When we got there, we were so impressed with everything. It is 100% worth the money. The guides were fantastic and very kind and caring. You went st your own pace and they never rushed you. I LOVED this hike and would recommend it anyone. 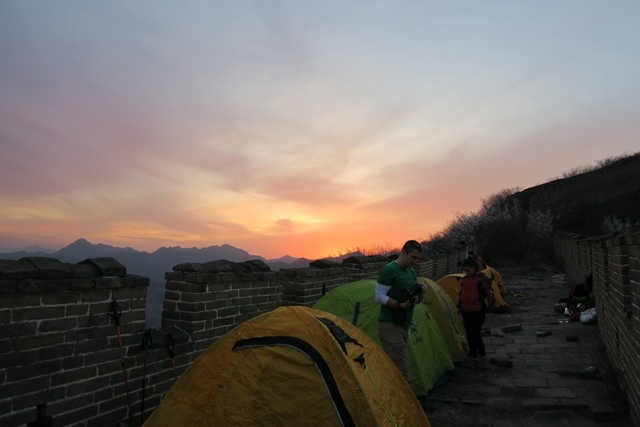 It has been almost a year since I went hiking and camping on the great wall but it is a memory that i will treasure. Heidi and Fred are really nice and really open. Fred is from Brugge (Belgium) which is very close to my hometown. The experience to go on the wall and don t see any other tourists is really unique. The views are breathtaking. The food we got was from a local family and it was amazing! Recommended! I've enjoyed visiting tourist sites in downtown Beijing, and even another portion of the Wall that was thoroughly reconstructed, but this trip to the Wall was the most rewarding by far! Myself and my friends were constantly in awe of the beauty of our surroundings and had a wonderful time visiting an authentic part of the Great Wall. We truly enjoyed a great, refreshing time with a guide who knew much and helped us enjoy our hike more through his knowledge. 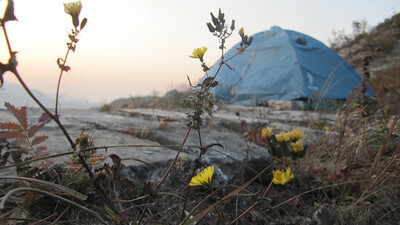 The campsite was beautiful, situated among the mountains with a view of the Wall. This tour was my favorite thing about my time in China and I will remember it forever.